My go-to Ben Davis shirt. Absolute staple in my wardrobe–comfortable, durable and looks good. Sleeves are a bit “on the button” and I would like them to be a touch longer like (1-1.5″ longer) but that is almost a quibble as I rarely wear these shirts buttoned at the sleeves, preferring to loosely roll them. What are the chest measurements for medium Large & XL, do you have a sizing chart? Is the button down the same measurements as the zip up shirts? Please send your sizing inquiries to customerservice@bendavis.com – thank you! 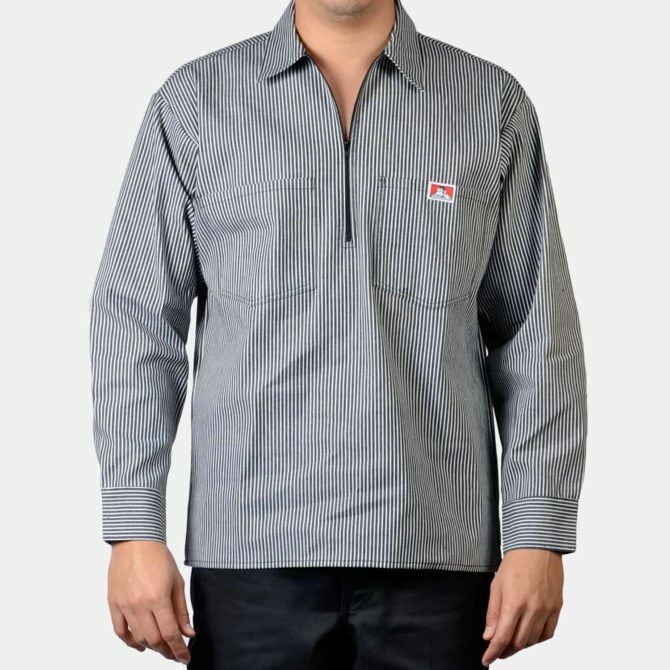 Is the poly/cotton shirt without front flaps and buttons? Do you still make a model with flaps? 100 % cotton? Please clarify, I need the flaps to keep things in my pockets secure and not dropping if I bend forward. Please send your inquiries to: customerservice@bendavis.com – thank you!